"Being Robin" - Feature Film Trailer from Hop Top Films Co. on Vimeo. 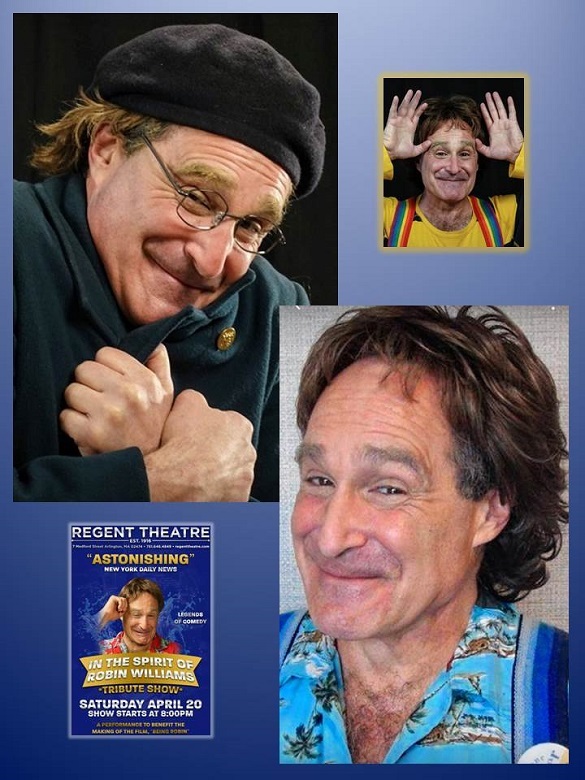 Spend an evening with America’s premiere Robin Williams tribute artist. You may feel you are in the presence of one of the funniest and most beloved comedians in history. Robin was not only a wonderful actor and comic genius, but a philosopher and humanitarian. The show is funny, poignant, and sometimes just a wild ride through the mind of a lovable madman. Robin seemed to always be teetering on the edge of childlike innocence even when he was being naughty. If you’ve never had the chance to see Robin in concert, now is the time! The show you will see is the subject of (and fundraiser for) an upcoming motion picture entitled Being Robin. The movie is about an artist who thinks he may be channeling the spirit of Robin Williams. While he wrestles with his sanity, he creates a live tribute to Robin, which becomes a national sensation, and a healing moment in our culture. Being Robin is currently in pre-production. Roger Kabler who performs the tribute and stars in the movie, will hold a short discussion about his unique film, with a Q&A. As a finale, Roger performs a collection of other impressions in his riotous piece, “Overacters Anonymous.” After the show, there will be a meet and greet in the lobby, a good chance for the attendees—including potential investors (hello!) to talk to Roger and the producers of BEING ROBIN.